"This unusual jelly has a variety of purposes. It can replace cranberry jelly with turkey for the holidays. It is lovely for breakfast toast and biscuits. Try it on pancakes!" Combine pomegranate and lemon juice with sugar in a large, stainless steel saucepan. Bring to boil over high heat, and at once stir in liquid pectin. Bring to a full rolling boil, and boil exactly 1/2 minute. Remove from heat, and skim off foam. Ladle into hot, sterilized jars to within about 1/4 inch of the top. Seal, and process in a boiling water canner for 5 minutes. See how to make the perfect jelly for PBJs. Very good recipe. With full rolling boil there was no problem with jelly setting up. I cut the sugar down by a cup as the jam was to sweet. It overpowered the flavor of the fruit. 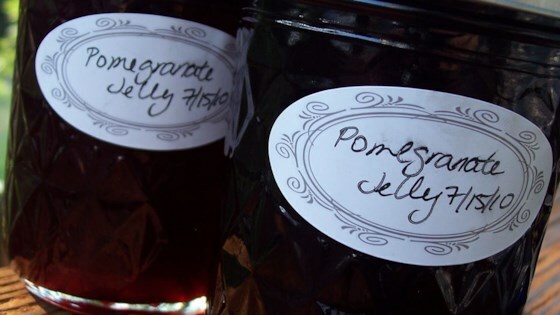 Pomegranite Jelly rates highest with my family and I make several jams and jellies. This recipe is quick and easy and "no fail". Thanks Allrecipe!